Get Your Amateur Radio License In 2019! 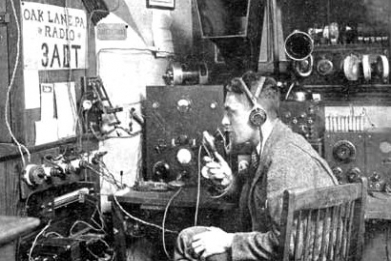 Amateur Radio Has Come A Long Way In The Last 100 Years! Thank you for your interest in wishing to learn about the ever-exciting world of amateur "ham" radio! 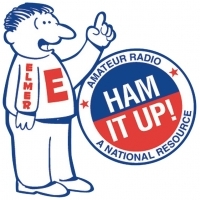 I have been offering classes in amateur & commercial radio for over 40 years, and now it is finally time to "pass the baton," as it were, to a new, vibrant group of instructors and ham mentors -- who we lovingly-call "elmers" -- to keep the excitement alive that many of us have found, communicating with fellow radio operators all over the world. I will no longer offer classes for STUDENTS, which I previously taught personally. I am now offering classes for ELMERS and INSTRUCTORS, to carry on with my colorful (and always lively) instructional techniques! My FREE One-Day Instructor / Elmer Classes will provide the teacher with every technique I employ to get students studying at home, well before the weekend class, and then the two days of student actual classroom training. There will be plenty of handout information on how to score free materials from manufacturers, and I will tell you how to get all my training materials at a discount and how to work with local stores to display your class flyers. I will reveal and demo some of my exciting classroom demonstrations -- the "inside secrets" of my personal teaching methods! Elmer / Instructor Graduates will also get listed on this web site with their upcoming STUDENT classes, teaching my exclusive "Gordo Method" -- locally and across the country! Beginning soon, you will see a list of instructor contact numbers for upcoming student classes. Instructors, if you are currently teaching a class with my materials, beam me your info, so I can put it RIGHT HERE on this web site for free! Thanks for all your support! Once again, I am NOT retiring from amateur radio, but rather bringing in MORE ham radio instructors to carry on with my fun ham radio classes! STUDENTS get started with your upcoming ham radio studies by calling 800-669-9594, and let W5YI help you get set up with all of my training materials, including my fun books, audio CDs, and the computer training course! ELMERS get started right now at www.haminstructor.com and register online, so you can receive all of my latest classroom techniques plus instructor materials, jacket patch, and a whole lot more! If you are here in Orange County, California contact Ham Radio Outlet at 714-533-7373 for my materials! Hope to hear you on the airwaves soon! ARALB - THE ASSOCIATED RADIO AMATEURS OF LONG BEACH provides amateur radio testing for $5.00 on the third Saturday of each month at 9:00 AM for those of you, who like to study on your own. Next testing date after Saturday, February 16, 2019 is Saturday, March 16, 2019. The test location is at the The Church Of Jesus Christ Of Latter Day Saints, 3824 Woodruff Avenue, Long Beach CA 90808 (behind the Dental Building). Click HERE for a map & directions. Pre-registration is recommended through Louise Chapman, N6ELK, at 562-429-1355 or send an email to . When you pre-register, your GLAARG Form 605X will be ready for you to sign when you come in to take your test. "GORDO APPROVED" TECHNICIAN LICENSE CLASS to be held on Saturday, March 9 and Sunday, March 10, 2019 at 8:00 AM to 5:00 PM on both days at the Cerritos Sheriff's Station Emergency Operations Center, 18135 Bloomfield Avenue, Cerritos CA 90703. Turn right upon entering the lobby and go into the Comms Center Conference Room. You lost? Call the EOC directly at 562-860-0044. Click HERE for a map & directions. All materials provided (Gordo text, Gordo pre-study homework, etc.) FYI: Format similar to Gordo's style with demos, hands-on, etc. Testing on Sunday promptly at 3:00 PM. Sorry, but no "walk-ins" for class or license testing. At the moment, we are unable to test for any Amateur Licenses other than Technician, but please email ahead to verify space and testing availability. Classroom space is limited to 18, so register early! Course fee $60. Test fee $14. Registration required. Click HERE to download the Class Flyer for more information. Email Ralph Wynkoop KI6JAR at to register for this class!! ARALB - THE ASSOCIATED RADIO AMATEURS OF LONG BEACH provides amateur radio testing for $5.00 on the third Saturday of each month at 9:00 AM for those of you, who like to study on your own. Next testing date after Saturday, March 16, 2019 is Saturday, April 20, 2019. The test location is at the The Church Of Jesus Christ Of Latter Day Saints, 3824 Woodruff Avenue, Long Beach CA 90808 (behind the Dental Building). Click HERE for a map & directions. Pre-registration is recommended through Louise Chapman, N6ELK, at 562-429-1355 or send an email to . When you pre-register, your GLAARG Form 605X will be ready for you to sign when you come in to take your test. ARALB - THE ASSOCIATED RADIO AMATEURS OF LONG BEACH provides amateur radio testing for $5.00 on the third Saturday of each month at 9:00 AM for those of you, who like to study on your own. Next testing date is Saturday February 16, 2019. The test location is at the The Church Of Jesus Christ Of Latter Day Saints, 3824 Woodruff Avenue, Long Beach CA 90808 (behind the Dental Building). Click HERE for a map & directions. Pre-registration is recommended through Louise Chapman, N6ELK, at 562-429-1355 or send an email to . When you pre-register, your GLAARG Form 605X will be ready for you to sign when you come in to take your test. Your classroom instructor and I have some exciting training lined up for you, with lots of live-action amateur radio excitement ahead! We really want you to have a successful study experience, as you prepare yourself for the FCC Technician Class written exam. When you pass, you’ll receive your first amateur radio license and FCC call sign. By studying my yellow cover book TECHNICIAN CLASS, and using this Home-Study material and the audio CD, you’ll also be ready to get on the air! I encourage you to get a head start on class with this home study course. Go through selected sections of the book with this course before each classroom session. These home study quizzes closely follow the book, and I even include page numbers to guide you to the correct answers! If you are studying on your own, first play the audio CD inside the yellow book’s front cover, and then begin working the book and this home study together. I then become YOUR personal instructor! The questions in this pre-study are in a casual, fill-in-the-blanks format. Your actual Technician Class FCC Element 2 exam will be multiple choice exactly like the book, which makes it all that much easier! You will likely spot the test’s correct answer in a nanosecond! We list some of my additional training resources in the back of this booklet. You may obtain them from The W5YI Group and use them to help you prepare for your upcoming exam. Call during the day, 1-800-669-9594. Tell them you’re working my home-study training materials. So, open my 2018 Technician Class Book, play the included audio CD, and then begin this fun home-study course! Remember, play that CD first! I come with the book as your personal instructor via phone or E mail! If you have any questions, or don’t understand a concept, or simply want personal words of encouragement, feel free to call me at 714-549-5000 Monday -- Thursday, between 10 am and 4 pm California time, and let's talk ham radio! You can also email me for help at . Are you ready? Here we go! Click HERE to view the Complete Technician Class License Home Study Q&A. Once again, welcome to Ham Radio! NEW INSTRUCTOR CLASSES FOR 2019! ATTENTION CLUB ELMERS & FUTURE INSTRUCTORS! These classes are open to club elmers interested in TEACHING with Gordon West's unique methods, demos, and materials, where Gordo will reveal ALL his secrets for YOU to have a successful class! Pre-registration is required well before class time! Call Gordon West at 714-549-5000 Monday-Thursday, 10:00 AM to 4:00 PM to reserve your space today! Learn how to stay on track, covering ALL the Q & A's for Technician, or General, or the Extra class you will be teaching. Learn what it takes to teach the commercial Marine Radio Operator Class, too! Learn how to NOT teach a cram course, but rather get students to study ahead of time, so YOU can spend more time preparing them to get on the air! Find out the techniques of choosing a fun VE team to offer exams at the conclusion of your class session. Explore how they may test young kids or the elderly. All instructor candidates will receive FREE W5YI materials in this instructor class, including instructor class pre-study materials, PowerPoint DVDs , and learn about discounted student materials, and how to score free band charts and maps - and receive the instructor patch from this one day course! REGISTER NOW TO RESERVE YOUR SPACE TODAY! Register by sending an email to to reserve your space today! Then go to www.haminstructor.com and also register online, so you can receive all of my latest classroom techniques plus instructor materials, jacket patch, and a whole lot more! Each special instructor class is preceded by home study materials mailed out ahead of time, long before the weekend class begins. These are NOT cram classes for ham radio licensing! These classes are for LICENSED HAMS, who want to become SUCCESSFUL HAM INSTRUCTORS! Once again, don't forget to register by sending an email to to reserve your space today! NEWLY-LICENSED? WELCOME TO HAM RADIO! AMATEUR RADIO VHF-UHF STARTER FREQUENCIES Here are some lists of my favorite Southern California repeater and simplex radio frequencies for the most popular VHF & UHF amateur radio bands. The lists below are configured for the popular Baofeng & Wouxun Chinese-made VHF-UHF dual-band portables, but you can input these frequencies into any virtually amateur radio, mobile or portable. If you need help programming your new radio with your computer, please feel free to contact my friend, Jason Gant W6AUX. His online blog at www.w6aux.com has loads of information to help get you started. The top two lists were designed especially for hams who are boaters and would like to monitor the marine channels along with the most popular Southern California repeater frequencies. The bottom two lists include MURS, FRS, and GMRS channels. Click on the links below to view/download the frequency list of your choice. BAOFENG PROGRAMMING SOFTWARE If you're a fan of Dan Smith's unique CHIRP Software for the computer programming of the inexpensive 128-channel Baofeng UV-5R dual-band radio, you will need the following image files. The first link below will take you to Dan Smith's "CHIRP Download" webpage. CHIRP is available for all versions of Windows, as well as Linux and the popular Ubuntu operating systems. Email Jason at w6aux@arrl.net, if you have any questions. WOUXUN FREE PROGRAMMING SOFTWARE If you're a fan of Dan Smith's unique CHIRP Software for the computer programming of the 199-channel Wouxun KG-UV6D/X dual-band radio, you will need the following image file. The first link below will take you to Dan Smith's "CHIRP Download" webpage. CHIRP is available for all versions of Windows, as well as Linux and the popular Ubuntu operating systems. The second link is an Adobe PFD file of Gordo's exclusive frequency list. The last link is the CHIRP file you will upload to your radio. Email Jason at w6aux@arrl.net, if you have any questions. GORDO'S MARINE RADIO OPERATOR LICENSE CLASS will be held on Thursday, November 21, 2019 at the Orange Coast College of Sailing in Newport Beach, California. Classes are from 9:00 AM to 4:00 PM, with lunch from 12:00 PM to 1:00 PM. Personalized instruction from Gordo. Materials and Gordo's Study Notes $99 plus $35 test fee. When you pass your exam, you will have the full priveledges of the MROP -- the FCC's Commercial Marine Radio Operator Permit! To register for this commercial radio class, please click HERE or visit www.occsailing.com for more information. Pre-registration is required well before class time! Call Gordon West at 714-549-5000 Monday-Thursday, 10:00 AM to 4:00 PM to reserve your space today! Technician, General, and Extra Class license upgrade classes are held regularly throughout the year. Check this website page for dates and locations. Free instruction from "Gordo-Approved Ham Instructors." Materials are usually $125 plus a $15 testing fee. Final exams are held on Sunday afternoons. Remember... You must hold a TECHNICIAN license to take the GENERAL upgrade class and hold a GENERAL class license to upgrade to EXTRA. New classes will be posted soon. In the meantime, click HERE to read a special message from Gordo regarding upcoming classes. I am happy to talk with you on the phone to help plan your upcoming adventure with ham radio onboard. I am available Monday through Thursday, 10:00 AM to 4:00 PM, California time, at 714/549-5000. THIS IS A FREE SERVICE! I have quite a library of past magazine articles on specific technical areas aboard boats and in RVs, and I am happy to share these articles with you once I better understand your upcoming travel plans. Fifteen to 20 minutes is the normal time for this free service, and I always look forward to hearing from my students during the day on the phone. Due to the volume of e-mail I receive from students throughout the world, phoning home is a quicker way to get started with your mobile communications plan. Sunday afternoon examinations are conducted by accredited FCC Volunteer Examiners. The test fee is $15 per exam session and is included in your $395 Zero to General Class License course fee. Please see our Class & Appearance Schedule for a listing of upcoming events & radio classes.